As we head out shopping this holiday season, it's easy to think of the most traditional categories: the hottest toys, the most sought-out electronics, the ultimate in stylish home decor. Of those, there are some holiday gifts that are practical and there are some that purely for entertainment, either of which is completely fine. After all, everything from a Barbie doll to a new coffeemaker has a place or serves a purpose in our lives. But what if there was something more? What if there was a way to provide a gift that could be enjoyed, while, at the same time, it helped to instill a sense of compassion? One that gives knowledge and a feeling of global responsibility? Inspiration and encouragement to take action in our lives to make a difference in the world? That's exactly what is found with World Vision. In the U.S., one in every five children lives in poverty and 44% of America's poor are in "deep poverty," meaning they live below half the poverty line. That number is among the highest ever and includes nearly 10% of all children in the United States! World Vision provides assistance to people in nearly 100 countries and the World Vision Gift Catalog is one of many programs designed to help eradicate poverty and provide hope around the world. Can you think of a better fit for the holiday season? First, those who want to give a general donation can donate to where it is most needed. Their donation is a one-time gift that will go towards needs that might otherwise go unmet. Second, shoppers can choose a meaningful, life-changing gift to meet the urgent needs of children here in the U.S. and around the world. These alternative gift ideas include goats, cows, chickens, school supplies, fresh water wells and much more, and have the ability to help children and families in struggling communities from all ends of the earth. Third, shoppers have the option of sending a card or giving a gift to a friend or family member, wherein that person can receive a beautiful, handmade gift such as hand-carved spoons, a fair-trade coffee set, handmade jewelry and more. That gift accompanies a contribution to the Maximum Impact Fund, which helps in the areas of greatest needs, and the recipient will receive a special card describing the gift and its impact. What an amazing opportunity to make an important charitable donation while still giving a meaningful, amazing gift! And, let me tell you, when one of these gifts arrives and it is absolutely beautiful while demonstrating the generosity of your gift-giver, it's hard to not feel immensely proud and special. 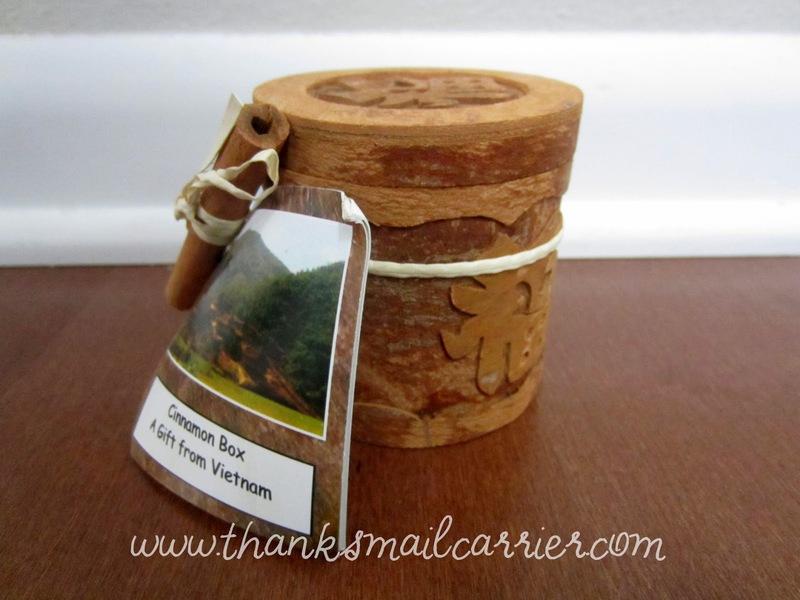 As I pulled the Prosperity Cinnamon out of its packaging, I was immediately smitten with the delicious smell as well as the simplicity and beauty of the carved bark box. I love knowing that Vietnam's renowned sweet cinnamon is a renewable resource collected from the Cassia tree and that is continues to be sold to benefit generations of hard working families. 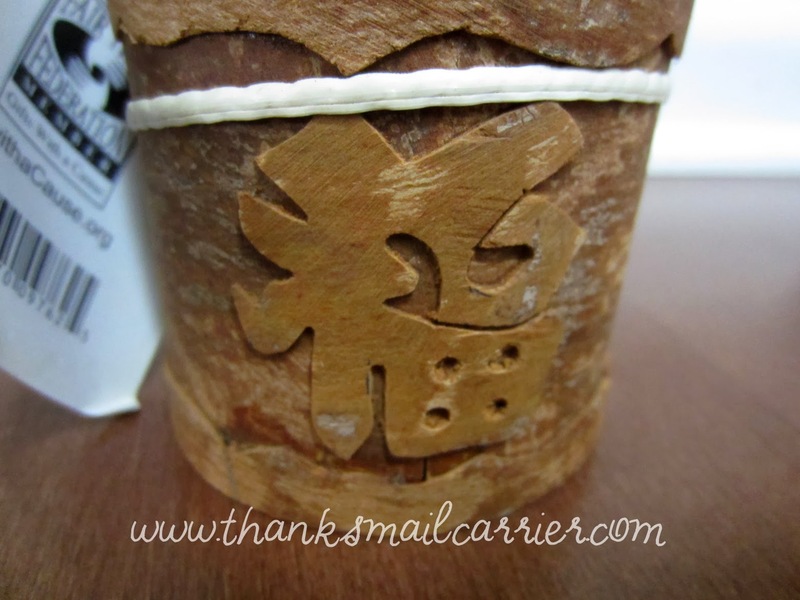 Not only will I be able to give this beautiful box featuring the Asian character for prosperity (and 3 oz. of cinnamon) as a wonderful gift, but it will also include the overall knowledge of supporting a great cause. I love that this will make such a unique gift but that it will also provide a perfect lead-in to tell people about World Vision and the large selection of gift options that they have available! The 2013 holiday season marks the 18th annual edition of the World Vision Gift Catalog and I couldn't be more proud to help support it. In 2012 alone, the World Vision U.S. Gift Catalog raised over $33 million and provided assistance to more than 825,000 people around the world. Last year, more than 67,000 goats were purchased by donors, and while a goat ($75) may be World Vision's number one seller, there are more than 250 items online to choose from (more than 30 gifts in the catalog are $35 or less, including items like chickens, job training or school supplies). This holiday season, don't just give a gift. Consider a gift from the World Vision Gift Catalog, knowing that it can significantly improve the life of a child or family in need by providing tools and opportunities to overcome extreme poverty. At the same time, your friends and loved ones will be honored as they read their special card describing the gift and the impact it is making. Now that's the true spirit of Christmas. To find out more about the World Vision Gift Catalog, you can watch their video explaining how the catalog works, visit them at WorldVisionGifts.org, and connect with them on Facebook, Twitter and Pinterest. A big thank you to World Vision for providing Prosperity Cinnamon for me as well as for one lucky giveaway winner. The opinions shared are my own and honest and if you really need to see more, click here to see how I roll. That's pretty good that they help people in 100 countries and you can help them by knitting. Very comprehensive catalog--and not just handmade items, but animals and water etc.! I think it is a good idea to buy a gift and help someone at the same time1 thanks! This is a great program I love that you can donate animals and clean water. THanks for sharing! I saw this catalog last year, unfortunately, too late to buy any of my gifts from it. Thanks for this early reminder! what a great idea!! I would love to give back and give a gift. It seems like a very worthy organization to give money to. What a beautiful idea! I love that you can buy sustainable gifts as well as consumable ones. i think that it is a great opportunity to make a difference it alot of peoples lives. I love that you can donate animals and clean water and they have some cool things in their gift catalog. Thanks so much for the fantastic giveaway! I am amazed at the diversity of the catalog! What a wonderful company! A wonderful idea. I like that you also include the U.S. I like to give gifts that give back ! I have never seen a catalog like this - so many gifts that actually mean something! Beautiful gifts and beautiful causes! As someone else posted, "Gifts that give back!" I like that you can order gifts online and at the same time make donations. Truly a gift that keeps giving. what an awesome idea! I think this is an awesome way to give--things that really make a difference in people's lives. It is interesting that there is an offering for $250 Worth of Necessities in the USA$25. I have never heard of this before but it looks really neat! That would be a great tradition to add for our children, I'm going to mention this to my husband. I think our girls would love to help others with this catalog! I love the fact that you can donate different things. I think it's great that you can buy specific charitable gifts. What a nice idea. I like the plush goat and pig. This is a great program to help those in need. I love the idea of giving water and animals to those in need. I love the Alternative Giving gifts where you donate money to a particular thing, like $35 gives hope to a girl rescued from sexual exploitation, instead of giving someone a material item. They do have those items for sale as well and fair trade practices are in place. I actually just got a catalog in the mail from them. We have a family tradition of having a yankee swap at Christmas so I think I may buy my gift from them. What I love about the World Vision gift catalog is you can purchase unique gifts that also help families abroad and in the states. We usually give bunnies, chicks or guinea pige each Christmas. such a great foundation! What a wonderful idea! And for the people who have everything, the alternative gifts are fantastic. I really like the idea of purchasing an animal and contributing to a community. I have shopped with World Vision in the past and will this year. We tend to give animals which are desperately needed. They are a great organizations with a wonderful reputation. Thanks for the super giveaway opportunity. Keep up the terrific blogging. 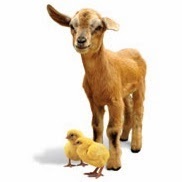 I like the idea of giving the gift of farm animals. I think we are going to start doing this. This is what the holidays are all about. Giving and showing love for one another. Love this catalog! I love catalog and donating clean water that is awesome! I love that the catalog helps empower impoverished children! I love gifts that are beautiful but also give back. And I love knowing how my dollars are helping elsewhere. I LOVE this idea and it is PERFECT for my SIL!! I love the idea of purchasing a gift that is supporting someone else. I have been in love with the work that World Vision does for years! I'm hoping as our kids get older that we will do a World Vision Christmas one year and send the money we would spend of gifts to World Vision to help needy families all around the world. I like that they increase awareness of all the suffering in thw world, like in the Phillipines and Syria. Beautiful way of remembering Christmas. The catalog has beautiful items and I love that they are made from local artisans. 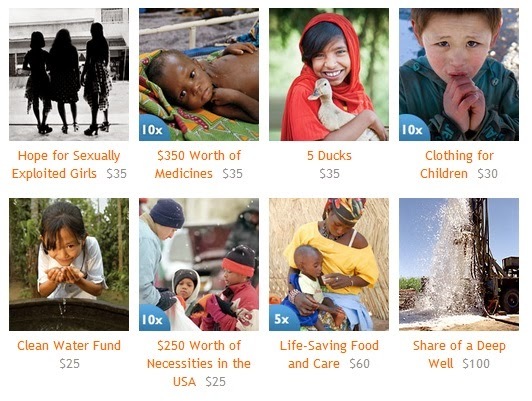 World Vision is worth supporting, even without extra gifts. I like that I am helping others first and foremost! Then.... while helping others you can provide gifts for loved ones, etc.... Love this giveaway! I think it is a great way to help others. I visited their website and am so glad to have found out about this organization! The vision and work is awesome. Thanks for sharing! I love that you can help others while buying great gift items. Win-win! The gifts are beautiful and unique and it's all for a great cause. I would love, one day, to be able to travel to a country where I could use my hands to physically help those in need. I hope we can do it as a family some day. The catalog is great and right up my alley as far as service and assistance goes. I like that you can give Micro Loans to people so that they can learn to help themselves. I love the catalog and the concept of helping with every purchase. I think the catalog and the concept are great, particularly in this day and age where people seem to be more in touch with wanting to help. I think it's a fantastic way to encourage economic assistance. Great needs and uses to help everyonE.Nice HANDMADE PRODUCT !!!! 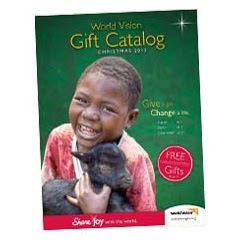 I love the whole idea of the World vision catalog and think I will use it this Christmas. I like the catalog it helps a lot of people. I like the Fair-Trade Coffee Set. Definitely a must have! Would be nice if everyone could help by purchasing! I love this catalog more than I can say. It is so fantastic that you get the privilege of helping others while getting great product. I will keep this company in mind. They're very caring and generous! I'm glad I am aware of them now. I think the catalog is inspiring and thought provoking. I think it's a wonderful and unique solution to such a huge issue. I love how you can search the catalog by category - it makes it so easy to find gifts for people based on what causes they want to help! I like the catalog. It is great to be helping others that really need it. I am glad to see the clean water as a gift to third world countries. I love how helpful the gifts are. They provide long term help instead of a bandage. I love the concept. I think it's a great lesson not only for our children, but also people as a whole. To give something life changing is better than any material gift you can buy. World Vision is a great organization and its catalog is full of wonderful holiday gift ideas --- although they make great gifts year-round. They prosperity cinnamon would make such a unique gift. i love their catalogue and the idea behind it. there is nothing greater than donating things people can use to better themselves. I love all of the choices they have to give. This would be great to get for those people who have everything, or are hard to buy for. It's nice that you can donate basic necessities to people in need. The cinammon looks delicious. I like that this organization helps others. They sound like wonderful gifts that keep on giving. I think this is a great idea! You get to help out a family, children, people in need. And you get something wonderful and handmade to boot! I love how you can pick various animals and other items that will help with specific needs. I really like the way you can pick what you want to gift, live animals, clean water or whatever, it is a great concept. I love that so much is accomplished through their sales, child protection, clean water,emergency care..on and on - Amazing! It's a wonderful cause and offers great things! It's a great catalog with a variety of choices. Great resource for altruism; I especially like the clean water! Thanks for the giveaway…the World Vision Gift Catalog enables you to assist people throughout the planet by purchasing tangible items that are needed in their family or community, or buying goods that they make themselves. World Vision is a trusted organization that has been vetted by independent auditors, so you know your money is being spent helping people.